Accuracy is something that I haven’t put a whole lot of thought into. I do have some TCXO (temperate compensated crystal oscillators) on hand, and some propeller boards on order to use them. Once I get the boards on hand, I’ll see if I can build up a version of the counter with verifiable accuracy. For a CPU I chose the Parallax Propeller. Many of my other projects have used the Raspberry Pi lately, but when it comes down to realtime programming, I like the prop. It’s easy to implement a deterministic realtime loop in one of the cogs while using the other cogs for other tasks, such as operating a display or user interface. 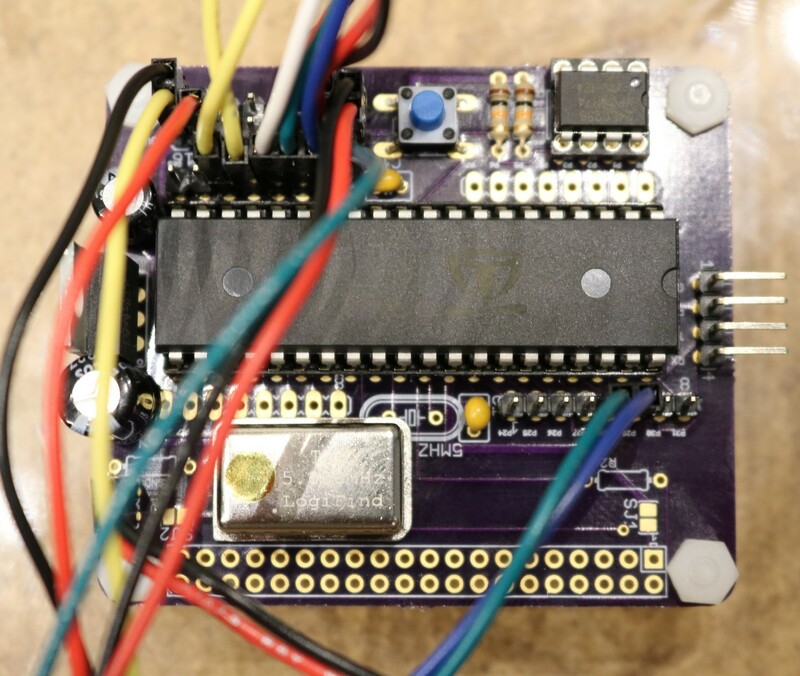 In building the prototype I first used a Parallax Propeller Professional Development Boar (PPDB), and then switched to a Propeller Proto-Board. There’s very little that needed to be done in the way of digital work — the counter signals basically come in on a couple of pins and the display data goes out via I2C to my nixie driver boards. 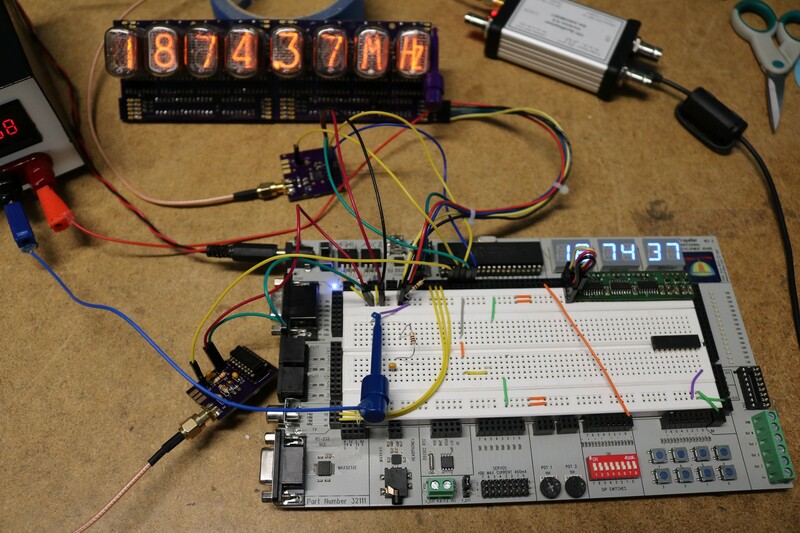 I used the same boards that I used for the Nixie Tube Calculator project, also described in an article and video of mine called ‘Controlling Nixie Tubes via I2C’. Basically the way these boards work is to use K155D Nixie Tube drivers controlled by I2C IO Expanders (MCP23017 and PCF8574). 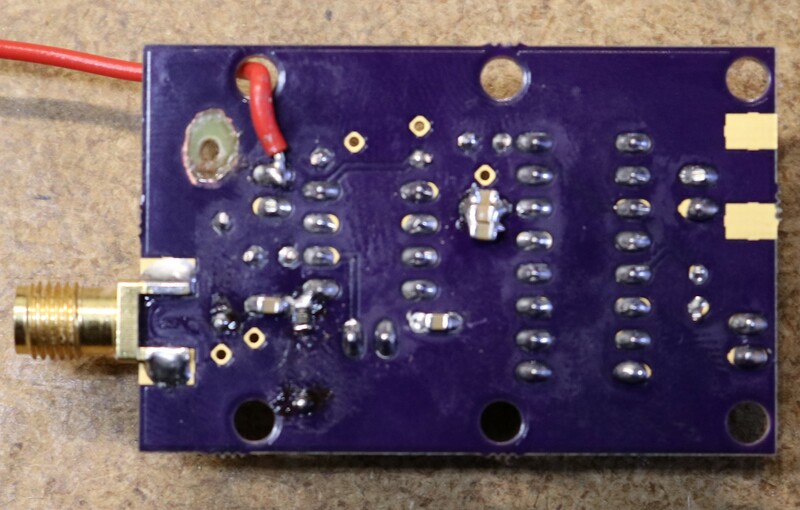 These boards can be daisy chained to control up to 32 Nixie Tubes. 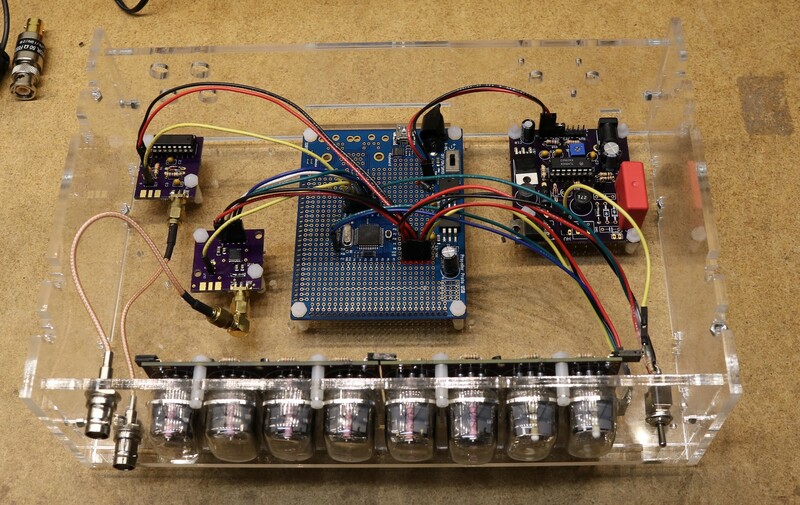 I only needed 8 tubes for this project, controlled from two of my Nixie Display modules. The modules also allow control of the decimal point, and there’s even a provision for LED backlighting. The tubes I selected are the popular IN-12. They’re quite easy to obtain on eBay, cheap, and are easily socketed to a pcboard. Also available are the IN-15A and IN-15B which display a variety of symbols. The IN-15A allowed me to display “M” or “K” (for megahertz and kilohertz, respectively) and the IN-15B allowed me to display a “Hz”. Yes, I did waste tube budget on a tube that I only use to display the “Hz” symbol and nothing else. I use a variant of my HVPSU, described elsewhere in my blog. It’s a TL494 boost converter that outputs around 160V to light the tubes. 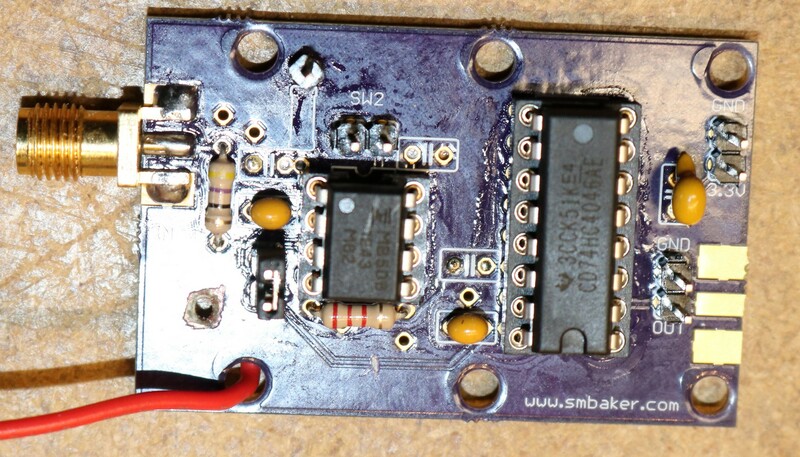 Also present on the power supply board is a 5V switchmode power supply to power the propeller proto board. I was able to get the Propeller to count the output of the 74HC4046 directly to about 32 Mhz. 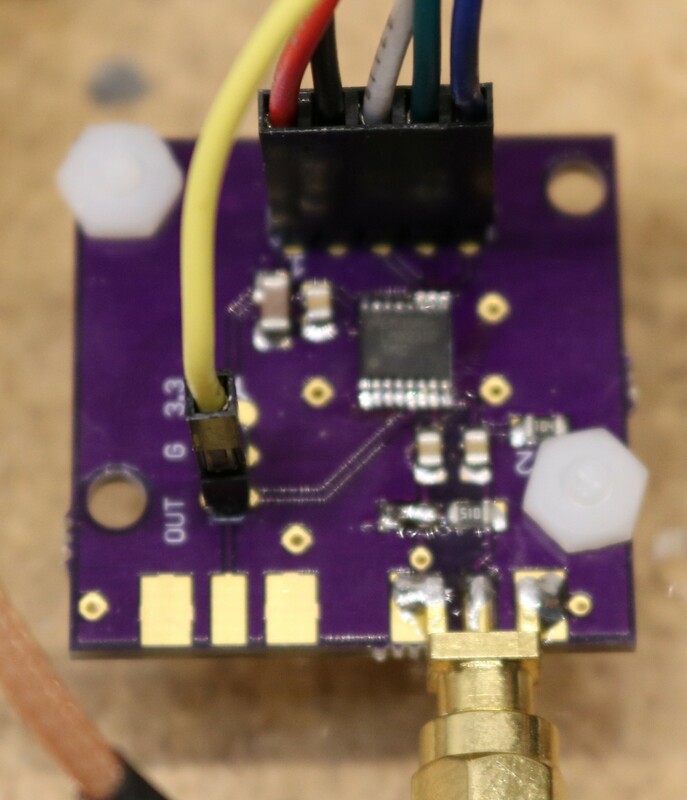 We could probably get a bit more out of the 74HC4046 by adding a frequency divider and using the prop to count the divided frequency, but we’re not going to make it anywhere near our Gigahertz goal with that approach. So it’s time to develop a hi-range front end. 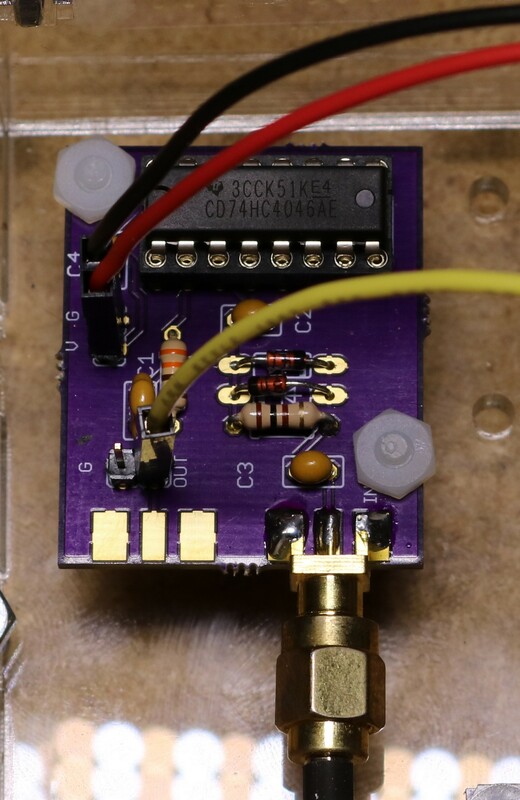 For the hi-range, I wanted to be able to get from 25 Mhz to a couple of Gigahertz. 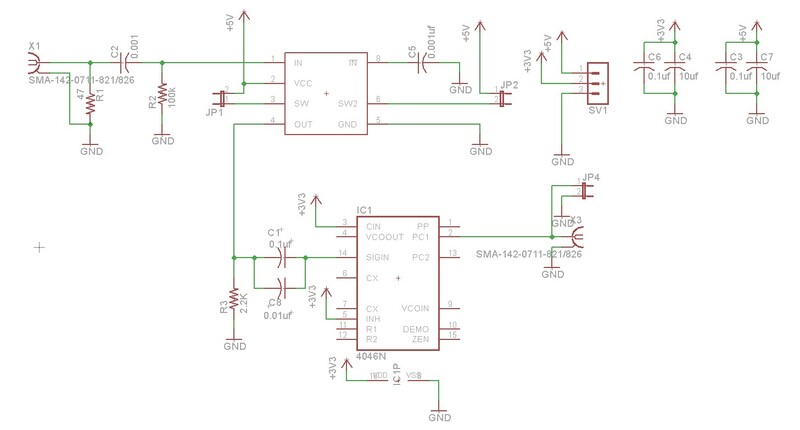 Again, scouring the Internet I saw some people using an LMX2322 prescaler in their designs. Like the 74HC4046, this thing is intended for phase locked loop applications, but we can get away with just using the detector and prescaler functions. It’s controlled via a serial interface that lets you configure the prescaler. Configuring the prescaler is a bit weird, and took some time to figure out. It’s a 32/33 prescaler. It takes a pair of numbers, A and B, and it divides the input frequency by 33 A times, and then divides by 32 (B-A) times. It also has the restriction that B must be greater than or equal to 3. So let’s take a simple example. Let A be 0 and B be 3. This is the minimum values that we can use. It’ll divide the input signal by 33 zero times, and then divide by 32 three times. This yields a divide-by-96 function. I ended up going with A=0, B=4, which yields a divide-by-128 function. Thus when there’s a 1 Ghz input signal, the LMX2322 will output 7,812,500 Hz. We just have to multiply our measured frequency by 128 to get our display value. The accuracy of a standard crystal isn’t really greater. There will be about a 50ppm manufacturing variation plus there will be variation of the overall oscillator circuit with temperature. To get a reliable frequency reference, it makes sense to use something called a Temperate Compensated Crystal Oscillator. You can get 5 Mhz TXCOs on ebay for about $15. Expensive, but it’ll get you an accuracy of 0.5ppm and compensation for temperature. I’m still planning on giving it one more shot with through-hole components once I get some new caps in (lead length can be really critical in RF designs, and I need to get the right size caps to fit the through-hole patterns instead of trying to fudge the wrong size packages into place). If I can’t make the through hold design, then I’ll switch over to SMD. One board board revision should do it. The good news is that the above board was stable to around 2.9 Ghz, which is beyond the spec of the MB506 chip. I like this project, I wanted to built something like this but in small scale 6 digits measuring 30Mhz max. 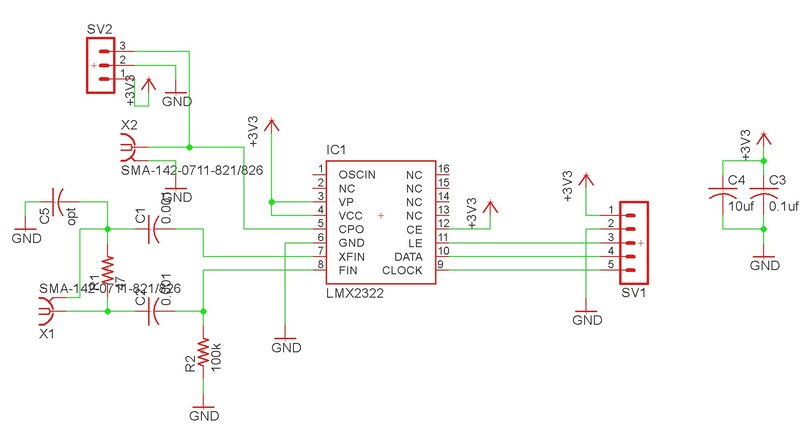 but i wished that you explain more about the CPU counter board, thats is the main thing to built this counter. Please, can you provide the connections diagram of the controller how wires connected to right pins ? As you mentioned there’s another one of your videos concern the nixie tubes board, I looked at it but found nothing I can get to know how to built one, still need the diagram of tubes with drivers including the I2C, can you provide that too ? At the end of the video, it shows the frequency reading demonstration, it looks like the readout response when injecting the signal from the generator is slow, at the moment when you were turning the generator knob the readout wasn’t following the same speed as the knob, the counter might have the gate timing issue, not quiet enough time to read faster ! !